Abstract: “Tahoe”, a 6 year old Labrador Retriever, presented for a sudden onset of right pelvic limb lameness. After a tibial plateau osteotomy (TPLO) was performed, Tahoe returned for four acupuncture sessions. Selected points included: ST 34, ST 36, SP 6, SP 9, points along the bladder channel near spinal segments L3-L6, as well as GV 20, GV 14, and Bai Hui. Once acupuncture sessions were started, the owner noted less need for oral medications to help manage pain and lameness. “Tahoe” improved from a grade 4/4 lameness prior to surgery, to a grade 1/4 lameness post TPLO and acupuncture. History and Presentation: “Tahoe”, a 6 year old male neutered Labrador Retriever, presented for not being able to place weight on his right pelvic limb. Tahoe was recently at the dog park where he suddenly became lame after chasing a squirrel. Tahoe has no history of any other illnesses or injuries. Previous surgeries include a routine castration. Physical Examination and Clinical Assessments: On physical exam, “Tahoe” was non-weight bearing, with a grade 4/4 lameness of the right pelvic limb. His BCS was 6/9. His vitals were within normal limits, and he was bright, alert and wagging his tail. “Tahoe” was very tender and guarded on palpation of the right pelvic limb, with moderate pain associated with hyperextension of the right stifle and on attempted drawer palpation. There was positive cranial drawer and tibial thrust without sedation. There were no major abnormalities noted on neurologic exam. Myofascial palpation revealed tenderness to palpation of the paraspinal lumbar muscles, as well as quadriceps and hamstrings of the left pelvic limb. Considering patient’s size and physical exam findings, referral to an orthopedic surgeon for a second opinion was warranted. “Tahoe” was started on 50mg deracoxib once daily, and 100mg tramadol every 8-12 hours. Medical Decision Making: Since Tahoe underwent surgery for his cranial cruciate injury, goals were to enhance healing, treat pain, improve knee circulation, and treat any myofascial restrictions. Points selected included: homeostatic points, relevant spinal segments, as well as regional points. Selected points included: ST 34, ST 36, SP 6, SP 9, points along the bladder channel near spinal segments L3-L6, and GV 20, GV 14, Bai Hui. Homeostatic points (GV 20, GV 14, Bai Hui, ST 36) were chosen to change the overall inflammatory state of the patient, provide sedation, and provide general analgesia at the central and spinal level. Nociceptive input from the painful limb was also brought into consideration in selection of points as this could lead to windup pain with somato-somatic reflexes causing tightening of the lumbosacral musculature. Regional points were selected to help reduce pain and inflammation as well as improve circulation, stifle integrity, and proprioception. This was due to neural features of these points including local golgi tendon organs, vascular companions, anastomosis, fiber complexity and muscle spindles. Massage was used in the region of the triceps and along the axial skeleton to free fascial restrictions, restore normal circulation, and reduce muscle spasms and discomfort. Differential Diagnoses: Differential diagnoses included injury to the ligaments of the knee: cranial and caudal cruciate ligaments, the medial and lateral collateral ligaments, and the patellar ligament. Other differentials include meniscal tear, osteochondritis dissecans, osteoarthritis, pes anserine bursitis, soft tissue based conditions, such as iliopsoas strain or myopathy, tendon damage or pathology, lower limb tendon laxity/strain, neoplasia such as osteosarcoma or synovial cell sarcoma. Definitive (or Putative) Diagnosis (or Diagnoses): The definitive diagnosis was based on the physical exam and confirmation from the orthopedic surgeon. Although it was important not to have tunnel vision, knowing that not all pelvic limb lameness are cruciate ruptures, this was a case that resulted in right cranial cruciate ligament tear. This was confirmed in the surgeon’s report, as well as the patient’s response to treatment. Acupuncture Treatments: Currently four acupuncture sessions have been performed on this patient. All sessions included dry needling using either 0.16mm or 0.20mm Seirin needles, and lasted between 20-30 minutes. Sessions were once a week. The first session was performed 11 days post TPLO. Each session included GV 20, GV 14, Bai Hui, ST 34, ST 36, SP 9, SP10 and BL 25, as well as two additional points lateral to the caudal border of the spinous process of the 4th and 6th lumbar vertebra, between the longissimus and iliocostalis muscles. These were needled bilaterally. The initial treatment included needling of only the left ST 34, ST 36, SP 9, SP 10, as well as other points previously mentioned. Following sessions included needling right ST 34, ST 36, SP 9, and SP10; the left side was not needled. During sessions, massage was used along the axial skeleton and forelimbs, focusing on the triceps muscles. 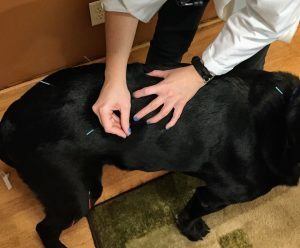 In addition to acupuncture treatments, Tahoe was administered 140mg polysulfated glycosaminoglycan (Adequan) intramuscularly in the epaxial muscles for a total of eight injections over four weeks. Tahoe was exercise restricted, confined to a kennel, and leash walked 3-4 times daily. Passive range of motion and weight shifting exercises were performed by the owner. 1. Chauvet, AE, Johnson, AL, Pijanowski, GJ, Smith, RD. Evaluation of Fibular Head Transposition, Conservative of Cranial Cruciate Ligament Rupture in Large Dogs: A Retrospective Study. J Am Anim Hosp Assoc. 1996; 32:247-55. 2. Mikashima Y, Takagi T, Tomatsu T, Horikoshi M, Ikari K, Momohara S. Efficacy of acupuncture during post-acute phase of rehabilitation after total knee arthroplasty. J Tradit Chin Med. 2012 Dec; 32(4):545-8.